We had a terrific downpour of rain this morning. It broke off some of the more twiggy rose stems in the Summer Border. There are plenty of buds on the shrubs so it’s not a problem… besides I now have lots of flowers for the house. 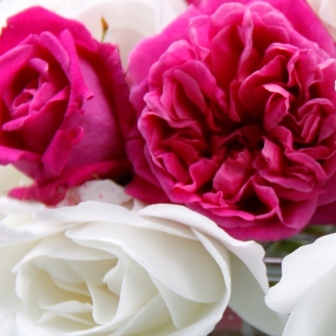 The pink roses are Tam O’Shanter and were bred by David Austin. They are a beautiful deep pink colour in bud fading to mauve when the flower is fully open and of course they have a wonderful fruity fragrance. The white rose is a climbing one… Rosa Iceberg. It flowers first in May then flowers continuously all summer as long as I keep dead heading it. I make sure that I cut a good length of stem off with the dead flowers which encourages new growth. It’s in a really sunny sheltered spot so this rose continues flowering well into autumn and winter. Some years I can cut roses from it on Christmas day.